allows placement in areas of limited tooth-to-tooth spacing. The DSI One-piece has been shown to be stronger when loaded to failure than most industry standard under-4-mm diameter implants . Those implants can be placed using a single-stage protocol, while soft-tissue experiences much less trauma than typical two-stage protocols. Due to uniform structure, it also has a very high success rate when immediately loaded. 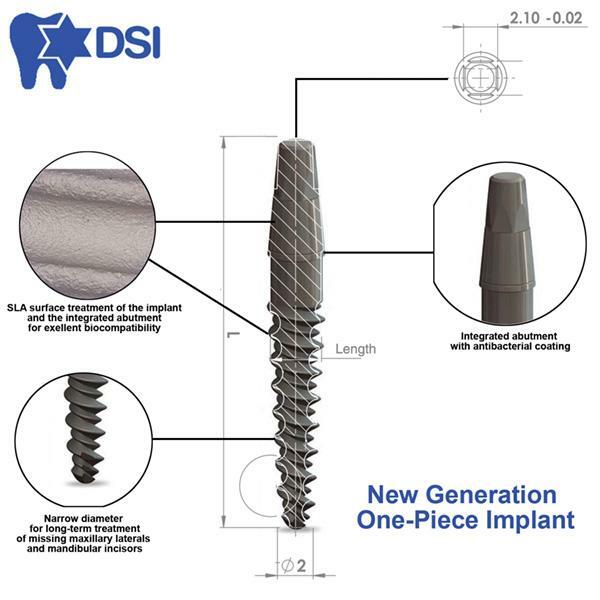 DSI One-piece is a small-diameter implant for the long-term treatment of missing maxillary laterals and mandibular incisors. hundreds of thousands of implants manufactured and successfully implanted worldwide. DSI Bone Graft is used as a filler and scaffold to facilitate bone formation and promote wound healing. This graft are bioresorbable and have no antigen-antibody reaction. This bone graft act as a mineral reservoir which induces new bone formation. Because DSI Syntoss Bone Graft is chemically created, and are part of a controlled manufacturing process, their physical properties (i.e., composition, morphology, and resorbability) are exceptionally reproducible. This synthetic bone graft material is composed of biocompatible calcium phosphate materials that are similar to that of bone and are capable of bonding chemically to bone and dental. This synthetic material are designed to fill the space of the missing bone and encourage the growth of new bone tissue. Can be used in any surgical or dentine procedure.